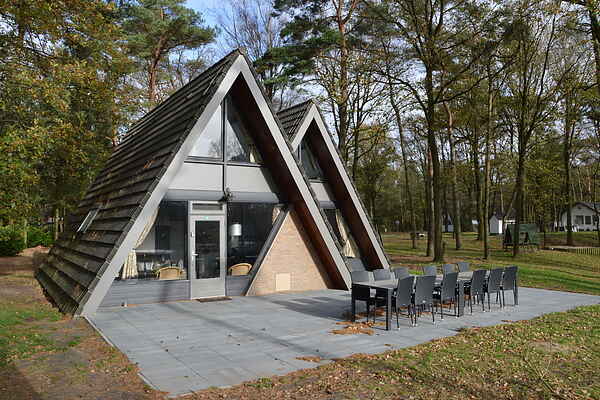 This beautiful, fully detached holiday house is located in a small-scale holiday park in North Limburg. The house is decorated in a charming design with warm colours and stylish accessories. Lodge-style decor was chosen due to the house's location in a natural area. The large front terrace is a wonderful place to spend time. The natural holiday park where this accommodation is located, 't Vosseven, is close to the Belgian border. The park has low motor traffic, giving top priority to nature and tranquillity, and is distinguished by its beautiful marsh. There is a delicious restaurant where you can enjoy a selection of dishes or a cup of coffee with Limburg flan. There is a variety of playground equipment for the kids. With nature preserves such as Tungelerwallen, de Grote Peel and Stramproy Heath, the forested and very rural surrounding area offers endless options for hiking and cycling. There is an extensive network of well-marked trails. Golfers will enjoy the various golf courses in the area and swimmers can always go for a refreshing dip at 'De IJzeren Man' in nearby Weert. Breadservice available during high Season!